Loveeeeeeee the yasha and pistol !!!! Thanks for the update...looks great. Thank you !!!! I love the yasha as well. One has been coming out and hanging out between the sand and glass, but the other is hanging out under the rockwork. I've read you should feed twice a day, so I've been target feeding with frozen mysis and a turkey baster. The clowns don't let anything get low enough in the tank. Haven't updated in a long time. 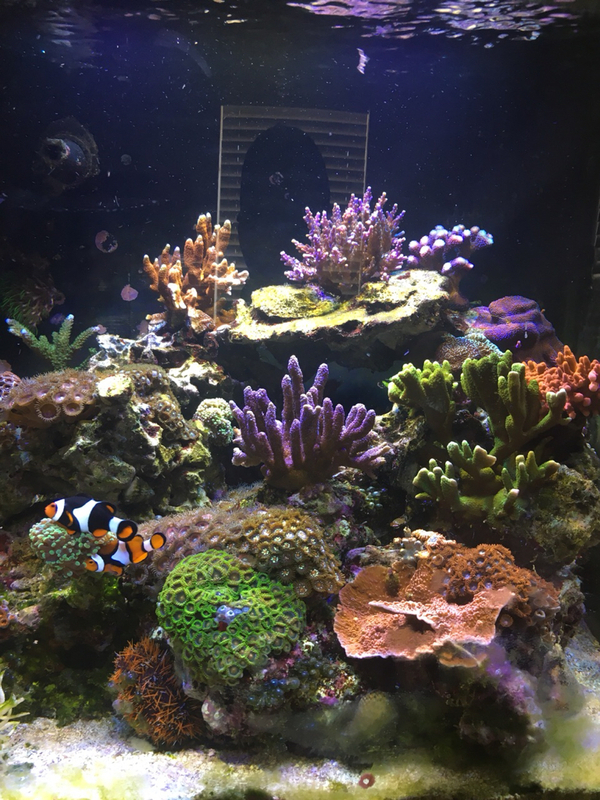 I went to a local frag meet, met some local reefers, and went 'off grid' a bit with the hobby. An update is long past due. Also, thanks to everyone who provided me assistance and encouragement along the way! Here's my current stocking, with pics below. I dosed with azythromyacin once because of an insane cyano breakout. Took my skimmer offline for a month or two, but I got it dialed back in. Only dosing is kalkwasser in my ato resovoir. New addition! Twin Spot Goby. Upon much deeper research, I recognize this is a very difficult fish and not the simple sand sifting goby I thought I was getting. I seem to have made a mistake, and now must make the best of it. I think I'm up to the challenge. If not I have an exit plan. So here's the plan: tonight when I fed, I dusted the sand bed with a mix of reef roids and coral delite; sharing much of the natural plankton food of the goby. I also fed a mix of frozen pe mysis, omega brine and cyclops. The goby took some brine and has been sifting the sand. I'm going to feed twice a day, and make sure the sandbed is full of goodies, a regular mix of the above. I'll spot feed the two spot brine - I do this already with my yasha. I took a lot of pictures, and if he starts to shrink/starve or doesn't get fat soon, he's moving to my friend's 600 with 28 square feet of sandbed. Best pic I have - sorry for the dirty glass. Thank you!! Gramma and thank you toomanyfish!!! jawfish and gramma are off the list then. Twinspot is the only sifter going in here. Firefish and tailspot blenny ar the top of the list. Haven't seen the Yasha's since the twinspot went in. Very nice job on the aquascaping TC! Looks really good. I have a royal gramma, had 0 territorial issues from him. I have 1 clown and the Mandarin, his and the gramma, usually hangout under the same rock at night. Only behavior I was surprised by was his excavation. He moved a lot of sand under my rock to make himself a lil home. Where in DFW are you? Saw the DNA containter & just wondered haha. Are they the lfs you go to most? Thanks for that - I didn't now the Gramma were diggers. I'm in north Dallas Closest LFS is Apex, and I go to Fish Gallery too... I'd say I've spent the most time at DNA. You? Congrats on the move! I'll come visit sometime. Small world! I now have bubble and gha at a minimum. I'm removing what I can manually, and I've stepped up WC's to every few days. My plan: keep with the aggressive WC schedule, remove the purigen once the algae regrowth slows, and add chaeto back to the fuge in back. Manually remove as much gha and bubble algae as possible. I'm looking at turf scrubber diy plans too, as an upgrade to the macro (and skimmer?) in section 2. I considered running gfo in addition to the purigen - surely the algae was eating the po4, and the system wasn't keeping up with the purigen? I also was convinced for 24 hours I had Dino, and looked at h2o2 dosing. I'm still contemplating next fish. Tailspot Blenny and Possum Wrasse are at the top of the list. I also like the Pink-Streaked Wrasse. I'm not adding anything until my chemistry is stable and the algae is diminished. My Jaebo powerhead died after 8 months. I have replaced with a MP-10. I'm very happy with this pump, and also understand why people like running two. I'm running saturated limewater in my ato pump. KH 7, Ca 400, Mg 1320, pH 8.2, NO3 0, PO4 .08 (Redsea). I had been reading low KH of 5 for a bit, but brought this up with more WC's. Last edited by TexChuck; 11/04/2017 at 11:37 PM. I've replaced the purigen with chaeto, and am now back to the filtration setup I started with. Intank media basket with floss, then chaeto, then Tunze 9001. 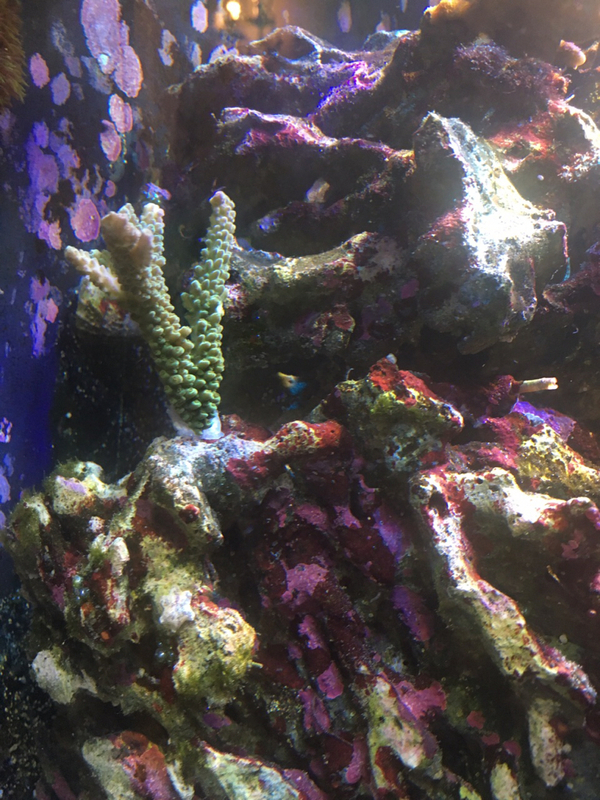 Coral growth has taken off since I stepped up the WC schedule, and nuisance algae seems to be much improved. Conditions are much improved. I did add a single small turbo snail at a reefer's rec and can tell a difference. 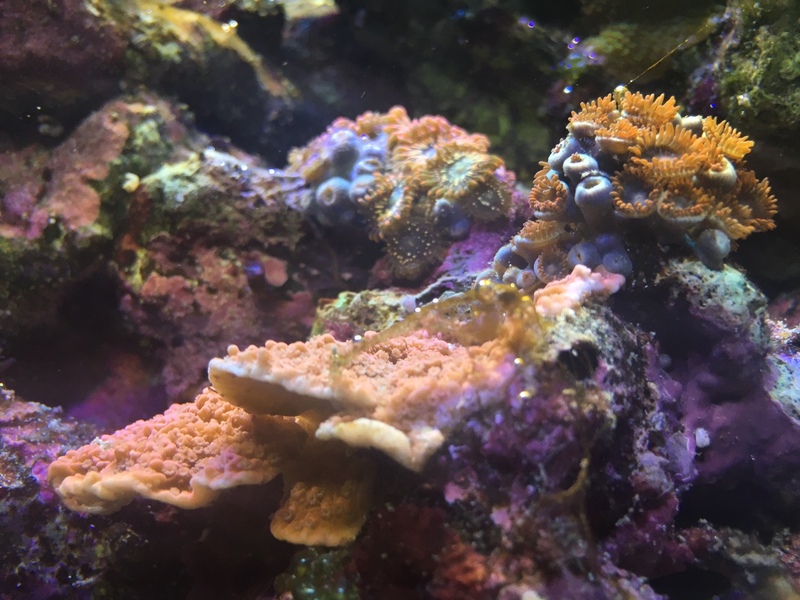 Here are some pics of new frags I added Friday . 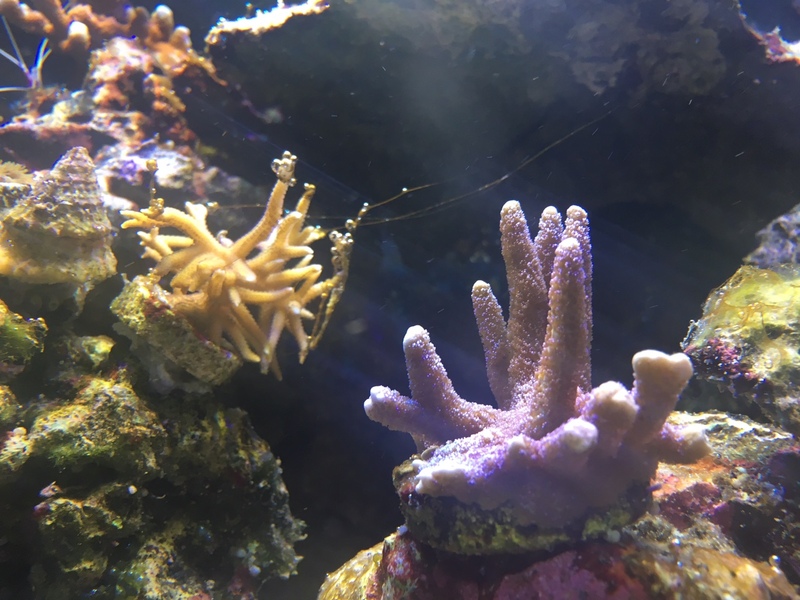 Also impressed by new growth on this birdsnest frag - thought it was dead after an extended ride on the urchin's back and a stint upside down in the stand. Still pale but recovery is promising. Hi everyone - been away a bit. Thought I’d post a 1 year update. Things are going great ! Some nuisance algae outbreaks, but nothing huge. I have some aiptasia to take care of. I lost my twinspot goby and my shrimp (cleaner, Randall, peppermint), but some could be attributed to old age. Inverts: Royal urchin, INSANE bristle worm population, tons of brittle stars, cerith and 1 turbo snail, and lots of other critters I haven’t quite ID’d. Filtration: tunze nano skimmer that I just added the cup back after 4 months aeration only, chaeto in the intank media basket, filter floss. No chemical. Flow: upgraded return pump (350 gph - original died a couple of months back), 1x mp10. Overkill but nice. Feeding: 2 cubes/day. Overkill but I like nutrients. Usually 1 PE mysis, and 1 either brine or cyclops. Tunze ato running Kalk, 5g WC / week is my goal. Don’t always make that, sometimes 10g every 2-3 weeks. 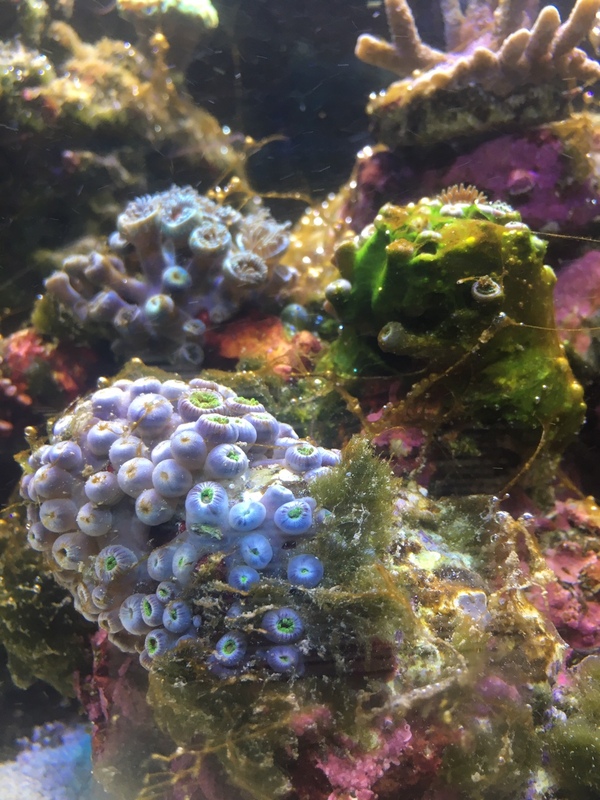 Coral: too many to name right now but I’ll put a list together if anyone’s curious. If I had it to do again, I’d do the roxkwork differently - no big cave in the middle, and much further away from the glass. Cleaning the glass can be a nightmare. Best lessons I’ve learned : patience, patience, and more patience. Nothing good comes quickly in this hobby. And, when in doubt, trust nature — chemical quick fixes can throw stuff out of whack in ways you can never understand. Good water, good lighting, good flow, and macro for nutrient export if possible. Don’t freak out and make drastic changes if you can avoid it. Great update! 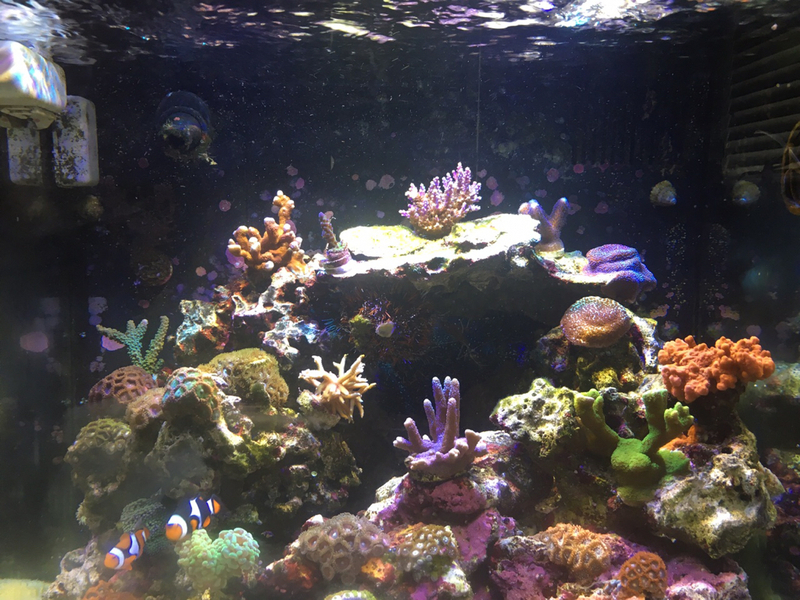 Your corals are looking great.....love them. Very nice! Have been eyeing one of the 32 BCs...those LEDs look like the work well. How were the ones that came with the system working? "I think you should reload your brain before you fire your mouth off"
I liked the stock ones, but after reading so many reports I decided to upgrade about 2 months in to the Steve’s LED kit. This is the older version with only whites and blues, and it’s been great. Quick install. Couldn’t recommend it more.